Rooms and apartments with a lot of comfort. 4 people. 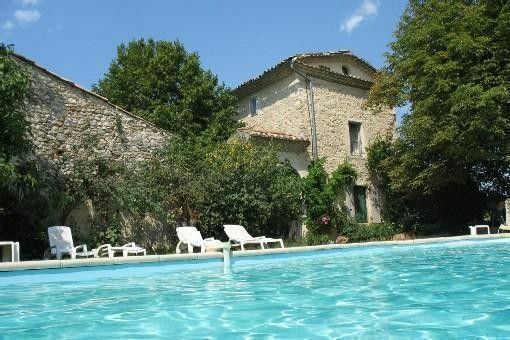 Staying at Janie Hirst's house in a provençal farmhouse with two apartments for 4 people in each apartment, and 2 nice rooms, a lot of comfort, en-suite bathrooms. In the countryside, near the charming town of Montélimar (5klm) and two villages Sauzet and Montboucher (3klm). Not far from the highway and very good to visit other places like Avignon, Vercors, Ardeche. Large swimming pool 11 x 4 m2 (May-September). Many of the beautiful places to visit and also the local attractions, perched villages and bike rides or hiker. Apartments 90sqm € 560 (low season) - € 860 (high season) per week. 4 people. PRICES ON THE QUOTE ARE FOR AN APARTMENT FOR 4 PEOPLE. IF YOU WANT MORE BEDS PLEASE WATCH THE PRICES, PER ROOM AND APARTMENT. IT IS NOT E134 a day for 12 people. The apartments are rented weekly May-September and September-May per day, week or month). Rooms per day. There- two double rooms. This house is a bed and breakfast for 20 years. Beautiful family house. Sorry we do not accept animals. Beautiful interior courtyard to eat and rest and find your peace! Not big parties or loud music. We would like to guard the tranquility of the house and the countryside. Nous avons passé un super séjour avec le soleil nous avons profité au maximum de la piscine et des nombreuses dépendances. Merci pour votre appréciation. J'espère vous reviendrez une jour. Nous avons été accueilli par Mme Hirst , nous avons passé un agréable séjour, au calme, tout était parfait, merci et a une prochaine fois !!! Merci Sophie pour votre gentil appréciation. Nougat factories, Crocodile Farm, hikes and walks, canoeing, forest adventure course of Robin, Ellip 6 Drive a F1, a helicopter a rally car or dive into the 3D world on a dynamic simulator 6 axes, karting, bowling, Resistance Museum, castles, markets, vineyards and lavender late June.